Video Game Urbanism: What can we learn from virtual cities? As with all forms of art, video games have a lot to say about how we understand the world. In video games in particular, we see represented the diverse ways we approach humanity’s most incredible institution: the city. “What is the city but the people?” asks Sinicus Velutus in Williams Shakespeare’s Coriolanus. The insight of the question grows out of the apparent tension between understanding cities as communities of individuals and understanding cities as pieces of technology. 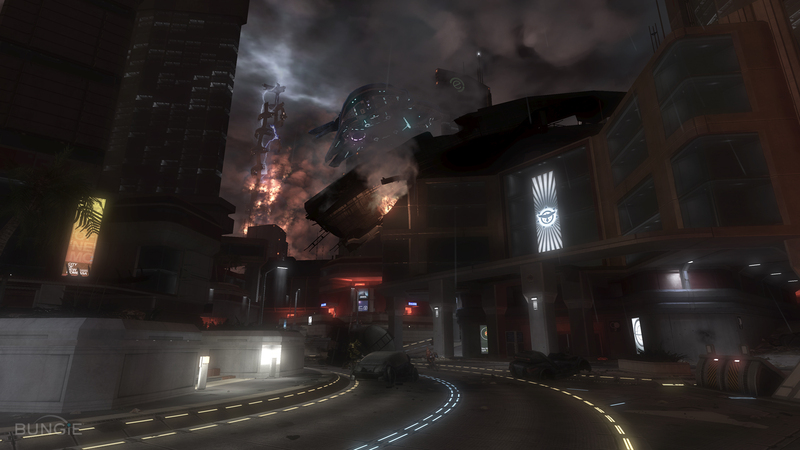 This tension can be best understood in comparing Clock Town from the The Legend of Zelda: Majora’s Mask and New Mombasa from the Halo series, specifically Halo 3: ODST. Clock Town is, first and foremost, a community. While the town’s medieval walls and narrow streets invite the player to explore, the true value of the city is found in the dozens of non-playable characters (NPCs) who fill its streets, squares, and alleys. Nearly all of these characters are involved in unique quest lines that typically incorporate a metaphysical spin on common social problems like romantic entanglements, child gangs, and political rivalries. The focus of the game quickly becomes exploring the complex social networks that make up Clock Town, with the city’s infrastructure becoming an afterthought. What is so utterly terrifying about the game’s omnipresent falling moon is not its potential to crush the physical clock tower at the center of the city, but to forever destroy the organic networks and collective projects of the residents of Clock Town. New Mombasa, on the other hand, is strictly a piece of technology. The futuristic east African city lies devoid of life after falling victim to forces beyond its control, leaving only the city’s grand boulevards and monumental skyscrapers. We are presented with a city that, even in peacetime, seems to function primarily as a means of rapidly creating, moving, and storing people and goods rather than fostering unplanned networks. Besides presciently placing the city in fast-developing Africa, the developers also emphasize the emerging importance of smart technology. The technological city itself is a starring character as the “Superintendent,” an artificial intelligence managing the city’s infrastructure. Human life, let alone community, is nowhere to be found – one interacts with the city as one would a vacuum cleaner or a coffee maker, namely, as an expertly engineered piece of technology. 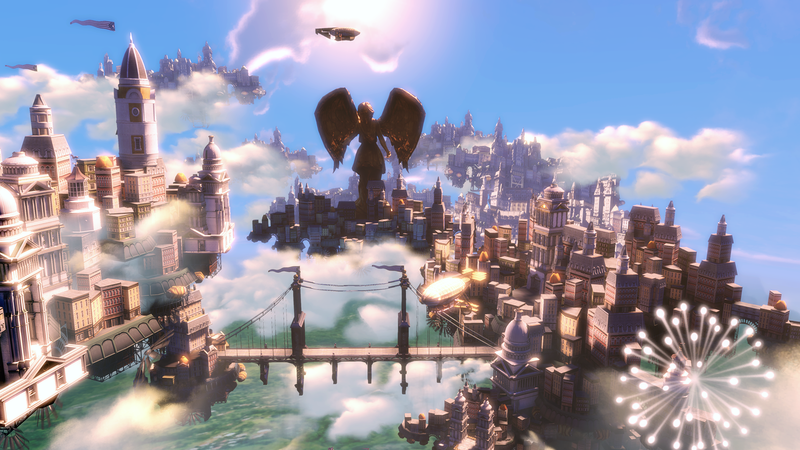 In developing this tension between cities as organic and cities as engineered, we might also compare the ideological project of an individual ruler depicted in BioShock Infinite with the self-organizing commercial hubs of massively multiplayer online games (MMOs) like World of Warcraft and Runescape. Political authorities have long treated urban planning as an aesthetic project to be executed in accordance with ideological values. Yet in fulfilling their essential role as a conduit for commerce, cities have often ended up decidedly unplanned, as the spontaneous order of traders, consumers, and entrepreneurs rarely produces the simplistic results preferred by planners. In Columbia, the setting of BioShock Infinite, we find a city that is decidedly shaped by the ideological preferences of a founder. Designed as the physical manifestation of American exceptionalism, the city floats above the clouds, with theocratic monuments serving as focal points and a hidden back stage obscuring the city’s legally enforced racism. In making the ruling ideology an inescapable part of daily life, the city reminds players of the grand plans of Adolph Hitler and Joseph Stalin to turn their respective capitals into Nazi and Communist utopias following the end of World War ll. By suffusing ideology throughout the city, with mandated architectural styles, forced separation, and strict controls on movement, Columbia denies residents their very right to develop their own conception of the good life. By contrast, the major commercial hubs of popular MMOs like World of Warcraft and Runscape, including Stormwind and Varrock respectively, serve primarily as places for individual players to pursue their own plans. A basic infrastructure is provided in the form of banks and open areas. Within this flexible space, guilds form, trade takes place, and friends meet. 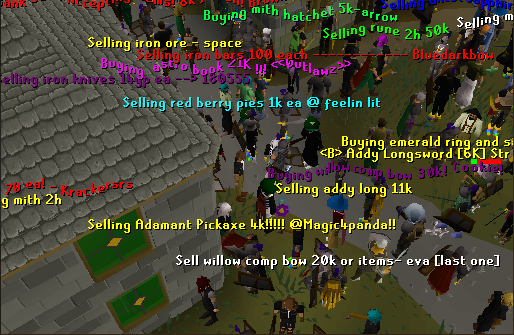 The ordered chaos of the Varrock and Stormwind marketplaces emerges spontaneously from the separate plans of millions of individual players pursuing their own unique projects. The cities in these games function not as works of art celebrating the vanity of a ruler, but as exhilarating spaces in which player-driven institutions may naturally develop. More foundational than the conflicting visions discussed above, a fundamental disagreement about the nature of cities permeates much of the Western intellectual tradition: are cities our natural home or an unnatural horror? While a tradition beginning with Aristotle treats the city as our home, a place in which humans may achieve their full potential, an equally strong anti-urban tradition weaves its way through thinkers and rulers as diverse as Tiberius Gracchus, Jean-Jacque Rousseau, and Thomas Jefferson. 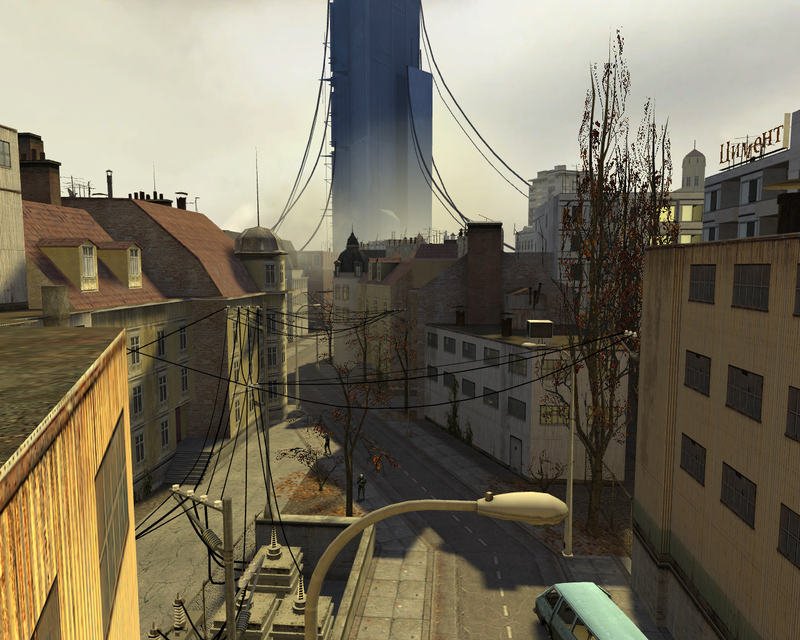 In Half-Life 2‘s City 17 and the many cities of Pokemon and Earthbound, we see this tension between “city as nightmare” and “city as home” clearly illustrated. City 17 represents urban life as an unmitigated nightmare—as a place of total control, dependence, and the elimination of natural life. On screens across the city, Wallace Breen, the city’s ever present ruler, reminds residents of the folly of natural instinct while encouraging conformity to the demands of the ruling Combine. Grim streets sit empty, and plant and animal life is nowhere to be found. Communities are non-existent, and any chance encounter with a resident is characterized by suspicion and fear. In City 17 we see the city as unnatural, opposed by its very nature to all that makes life worth living. In the many cities of Pokemon: Red and Blue and Earthbound, cities function rather as our natural habitat. They provide both a refuge from nature, in the form of Pokemon Centers and shops, and the challenges that drive our stories forward, in the form of gym battles and quest lines. The games treat cities not as something to be escaped, as in Half-Life 2, but as something we eagerly discover and explore. Cities like Onnett and Saffron City, like the cities of Varrock and Stormwind, function as safe bases from which broader adventures may grow. Wandering and socializing are encouraged, as each NPC offers the possibility of new information and new possibilities. The essential structure of each game can be best understood as a process of moving from town to town, meeting new people, acquiring new skills, and discovering for its own sake. 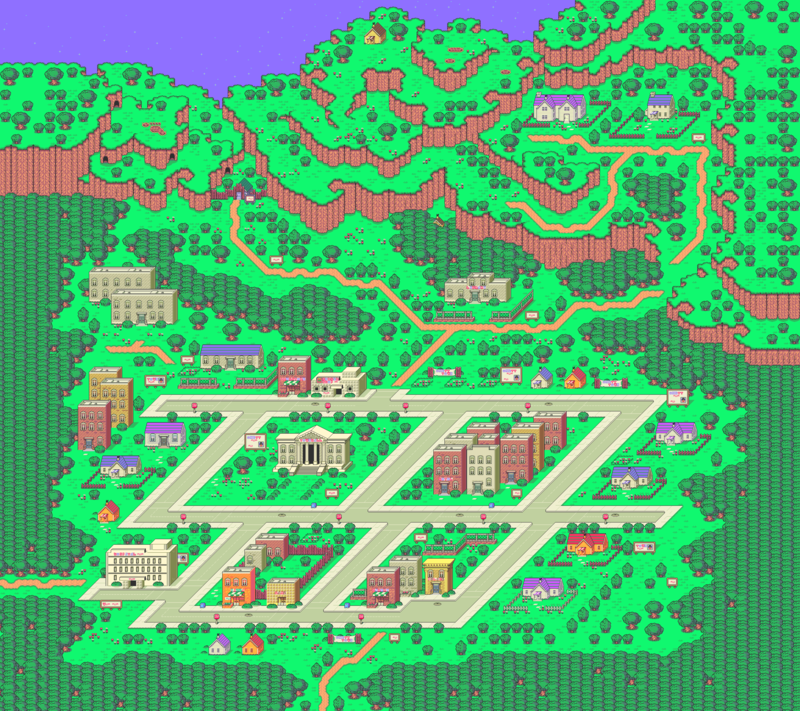 In Earthbound and Pokemon: Red and Blue, cities are presented as our home as a species. We can best understand these dichotomies by identifying the cities in which fighting takes place. In a community, a marketplace, or a natural setting, we primarily explore, socialize, and grow. In a machine, a planned order, a nightmare, we primarily hide, fight, and struggle. If video games cities reveal anything, it’s that the city we naturally desire is characterized by spontaneity and possibility rather than planned control. With this in mind, let’s learn from the Clock Towns, Varrocks, and Onnets, and make our real cities less of something we’re so eager to escape each day.